Height: 79 cm / 31 in. 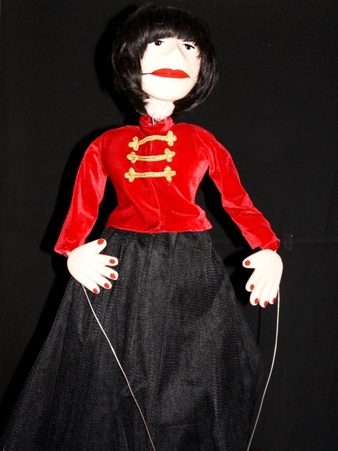 MIREILLE MATHIEU - rod puppet (79 cm/ 300 g) with moving head, mouth and hands, a parody of famous French singer Mireille Mathieu. The puppet is operated by one puppeteer. Materials: papier-mache, foam plastic, foamrubber, metal wire, fiber plastic, fabric. First presentation - September 19, 2000, Theatre Municipal of Charleville-Mezieres , France. 12-th World Festival of Puppet Theatre. The puppet participates in special projects.